I've waited a few days before commenting on the report entitled This Sceptred Isle by British Future, which came out on Monday, because I wanted to see the full polling data. This, for some questions at least, is now available here on the YouGov site. 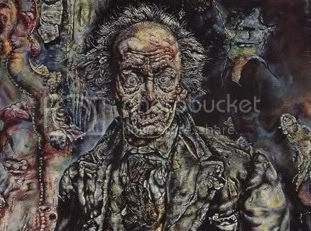 And which, if any, of the following best describes how you see yourself? ... Welsh not British/More Welsh than British/Equally Welsh and ... etc, etc. I don't want in any way to dispute the figures in the YouGov survey. 37% of those in Wales who identified themselves as Welsh (or who did not identify themselves as Welsh, English or Scottish) said they saw themselves as "equally Welsh and British", and that's fair enough. My point is about the conclusion to be drawn from this figure. To illustrate what I mean I would like people to consider what conclusion we would draw from a poll in Denmark in which 37% said that they saw themselves as "equally Danish and Scandinavian" or a poll in the Netherlands in which 37% saw themselves as "equally Dutch and European". It seems clear to me that Danes who answered in that way would certainly not be saying that they consider their nationality to be Scandinavian. Yet from the headline David Williamson chose for his article in the Western Mail it seems clear that he has interpreted the finding as being about nationality; YouGov themselves refer to this poll on their website as "Nationality Perceptions"; and it is clear that the people behind British Future have been very quick to interpret this as a statement specifically about national identity rather than about identity in general. I'm not particularly blaming anyone for this—least of all David, who is a thoroughly decent guy—but I am saying that this unspoken assumption needs to be challenged. I would suggest that it is not so very different from the unspoken assumption that being English and British are one and the same thing. That's what many people used to think, particularly in England, and it is still a fairly common assumption in most of the world. We can be glad that this perception has started to shift, and I think that our perception of what Britishness means needs to shift in a similar sort of way. I fully accept that there are many nationalists for whom "Welsh not British" is a core conviction. In terms of nationality I fully agree ... but only in terms of nationality. I believe that the nations of Britain have plenty of things which we share and can celebrate, and for that reason I won't object to being called British any more than a Dane would object to being called Scandinavian or a Jamaican would object to being called Caribbean. As we are seeing in the debate about Scotland, independence will not destroy the things which the nations of Britain have in common any more than Norway gaining its independence from Sweden, or Iceland gaining its independence from Denmark, have destroyed the common social, cultural, historic and economic ties between the Scandinavian nations. Until someone digs a ditch and tows the rest of this island off into the middle of the North Sea, Wales will remain British and we can be proud to be British ... although I hope we will balance that with a proportionate sense of shame for what Britain has got wrong. 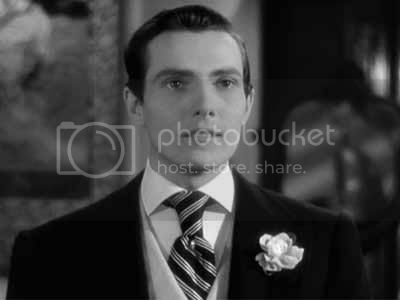 But it is a mistake to jump to the conclusion that this must mean remaining part of the United Kingdom. 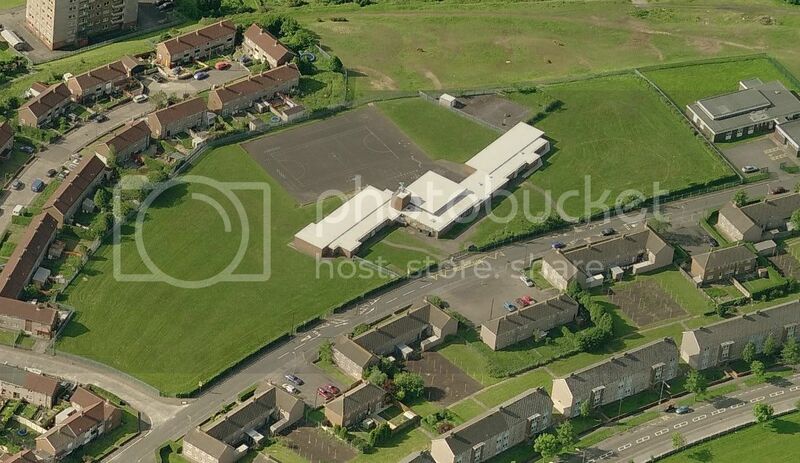 Those who read this blog regularly will already know about Swansea's decision to open a new Welsh-medium primary school in Bon-y-maen in the east of the city in the buildings which were used by Cwm Primary before it was closed in 2010. 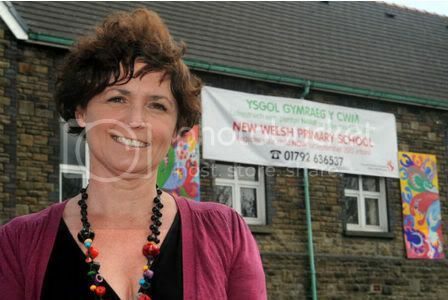 But today Swansea has announced what the school will be called and who the new head teacher will be. I'd like to add my congratulations to Rhian on her appointment as head teacher of the new Ysgol Gymraeg y Cwm, and wish her and the new school all the best for the future. If anyone can't quite read the banner in the photograph, it says that it's still not too late to get your child into the school this September. Just ring 01792 636537. Swansea Council will want to make a lot of the fact that there are now eleven WM primary schools in the city, and that the overall number of WM primary places has risen by 735 since 2004, as it says here. But that is not a particularly large increase (in terms of intake, it is just over a hundred) and some of this increase is just a paperwork exercise. Three of Swansea's existing WM primaries—Gellionen, Pontybrenin and Tirdeunaw—had already increased the intake of these schools over the previous five years to the point where they were more than 25% over their official capacity, and therefore had to apply for permission to continue to take in more children, even though they were not physically increasing the space available for them. Details are in this Consultation Paper, and the decision was approved (although the increase was slightly reduced, Swansea seem to have simply ignored it) here. So even with this new school, Swansea's other WM schools are bursting at the seams, and they appear to have no firm proposals for increasing capacity by opening another WM school elsewhere. There has been talk about building a new WM primary at Morriston and it is obvious that more provision will be needed there because Tan-y-lan, which was opened in September last year, is being forced to take in far more children than will be sustainable in the long term. As I noted here, in its first year it will take in 35 children, but only has room for 113 in total [see footnote]. It goes without saying that money is in short supply, and we need to recognize that Swansea has other schools which are in desperate need of repair or replacement. So even though I would love to see a brand new building to house a new WM school in Morriston, it would be some rabbit to pull out of the hat. Swansea need a plan B, and I'd like to remind them of a solution that I put forward at the same time as I proposed turning Cwm Primary into a new Welsh-medium school. Cwm Primary was one of three schools that Swansea closed in July 2010 because of large numbers of surplus places in their English-medium provision, the other two being Llanmorlais on the Gower and Arfryn in Pen-lan. RhAG in particular tried hard to get Swansea to open a new WM school at Llanmorlais, but their efforts fell on deaf ears and the building has now been sold anyway. But I have always thought that Arfryn was a more viable proposition, and the building still lies empty and in relatively good condition. Although opening a new Welsh-medium school in the Arfryn building doesn't provide a direct solution to the problem of demand in Morriston, it does offer an indirect solution which is almost as good. 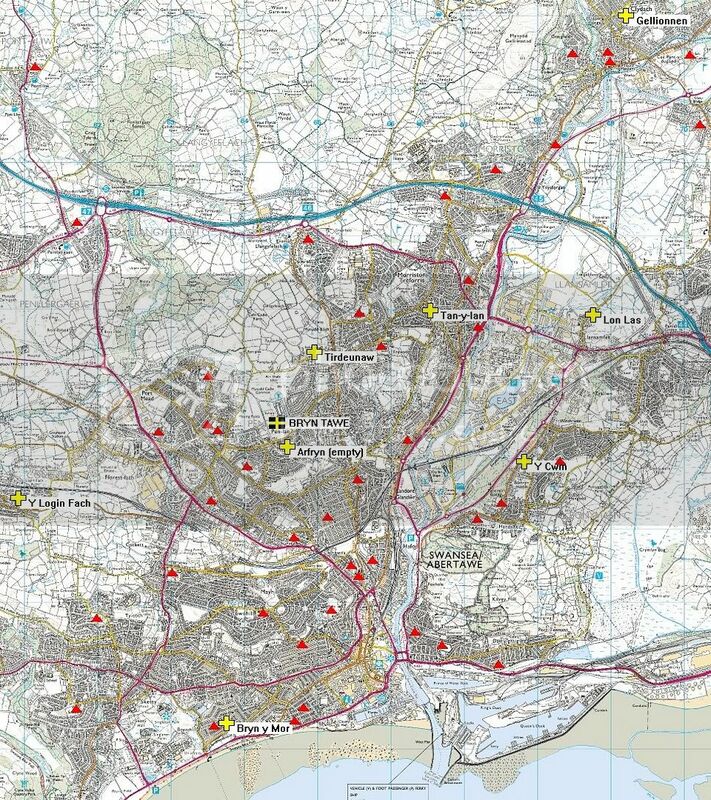 As we can see from the map below (click the map to enlarge it) Tirdeunaw is drawing pupils from Morriston to the north-east as well from the areas to south; so if a new WM school is established at the Arfryn building, it will ease the demand on Tirdeunaw from the south to enable it to provide more places for children from Morriston, something that Tan-y-lan cannot do on a sustainable basis because it is so small. It also helps fill the all-too-obvious gaping hole where there is no WM provision at all. So having got half of what I proposed before, it would be very satisfying to get the other half too. A new WM primary at Arfryn can be implemented quickly and at minimal cost. There is no reason why it can't be up and running by September 2013. Looking at the Schools Census Data, Tan-y-lan has 15 children in Year 2, 13 in Year 1 and had 10 in the Reception Year in January (there will probably have been a further intake after Easter). It is unusual for a school to start with a triple intake, normally the first intake is just for Reception and Year 1. This means that Tan-y-lan does have an intake that is sustainable in the long term. Sorry for the misinformation. It's been some time since I've written about Welsh-medium education, and I thought it might be good to make up for that by trying to put what has been headline news this past week into a wider perspective. That news was the story in the Western Mail about the local Chamber of Commerce's objection to Ysgol Gynradd Aberteifi changing from a dual stream school to a Welsh-medium school. For some time (see this post about Trimsaran in 2009) I have been convinced that gradually changing the language status of existing schools is a very good way of meeting the growing demand for Welsh-medium education. It is almost always better than taking the decision to close an English-medium school that is not viable due to low pupil numbers and then reopening the same building as a new Welsh-medium school, because it minimizes the disruption both to individual children and to the community. What happens is that a school will start to teach all new pupils in Welsh, but that children already in the English stream will continue in that stream until they move on to secondary education. The school will gradually become a Welsh-medium school over a period of six or seven years. What is now being proposed at Aberteifi is no different from what started to happen at Trimsaran in 2009, or what will start to happen at Ysgol Pencae in Penmaenmawr this coming September – a decision that was made by Leighton Andrews only three weeks ago, details of which are available from this page. As we can read in the Statement of Information, parents at Ysgol Pencae make a decision about which language stream they want their children to enter at Year 1. Far fewer parents choose the English stream. Only 5 out of 30 went into the English stream in September 2011, and the parents of only 3 out of 26 children in the current reception year have indicated that they will choose that option for their children this coming September. At Ysgol Gynradd Aberteifi, as we can read here, only 2 children out of more than 30 are in the English stream. This is unsustainable, in particular because such low numbers are bad for children in educational terms as there simply aren't enough other children in class to interact with even when different year groups are taught together. Any school, anywhere in Wales, with such a low yearly intake would almost certainly be earmarked for closure. If there is any difference between the two situations it is that there are schools very close to Ysgol Pencae, and any parents who want an English-medium education for their children can send them there instead without much inconvenience. But there is no other English-medium provision in the whole of south Ceredigion, the closest alternative being 31km away in Cei Newydd (English with significant use of Welsh) ... although Ysgol Y Ddwylan, a dual stream school just over the Sir Gâr border in Castell Newydd Emlyn, is some 16km away. Neither of these is particularly close, although it is worth noting that in other parts of Wales children have to make even longer journeys to get to their closest Welsh-medium school. The big question is at what point is it justifiable to do away with all English-medium provision in a particular area, or indeed whether it can ever be justified. All parents in Wales are able choose a Welsh-medium education for their children, although it sometimes involves having to travel a long distance to get it, paid for by the local authority; so should all parents have the same right to choose an English-medium education for their children? To answer this question the first thing to realize is that Welsh-medium primary education generally produces better results than English-medium education. 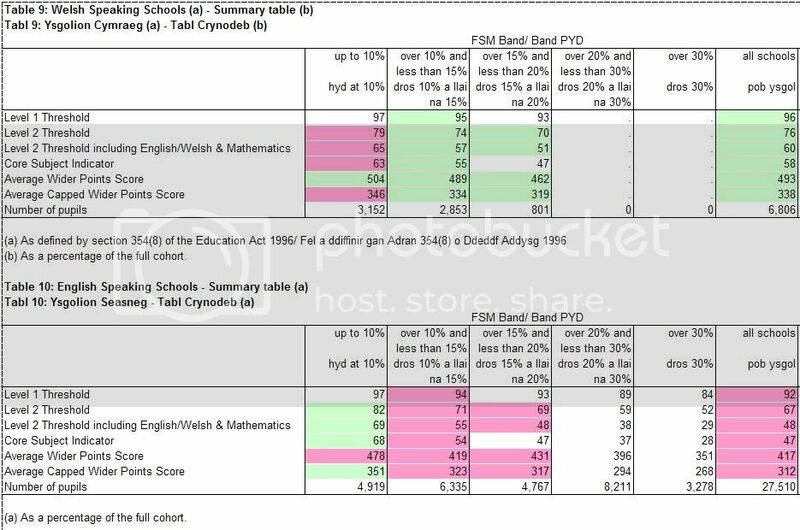 When broken down by free school meal entitlement to reflect deprivation, EM schools tend to do better in less deprived schools with up to 12% FSM entitlement, EM and WM are exactly equal in the 12-18% FSM band, and WM does better in the 18-24% and 24-30% FSM bands. But all these differences are marginal. The big difference is in Welsh. In WM schools children are taught Welsh to first language standard, but in other schools they are generally taught only to second language standard. However in both WM and EM schools, English is always taught to first language standard. Therefore the main advantage of WM education is that children become competent in both English and Welsh, rather than just in English. It is not absolutely impossible for children to become competent in Welsh if they go to an EM school, but it is unlikely. For all practical purposes, WM education is the best way of ensuring that your child is fully bilingual in Welsh and English. The second factor to consider is how important it is for a child to be able to speak and write Welsh competently. This is a value judgement, of course, but I would suggest that it is very much more important to ensure that a child is competent in Welsh and English in those parts of Wales where there is a higher percentage of Welsh speakers than it is in those areas of Wales where the percentage is lower, and that this difference justifies a difference of approach. Parental choice is a good thing, but it must always take second place to what is in the best interests of our children, and it is up to us as a society to determine what these are through democratically elected government. Parents do not and should not have the right to decide whether their children are taught subjects like mathematics or science, or to what standard they are taught English, because these are key subjects which are important throughout Wales. Why should it be different for Welsh in those parts of Wales where the language is important? That is why the Welsh Government will insist that local authorities measure and fulfill the parental demand for Welsh-medium education, but does not do the same for English-medium education in those parts of Wales where Welsh is more widely spoken. I think it is self-evident that a child who grows up in Gwynedd, Ynys Môn, Ceredigion or Sir Gâr (and perhaps west Conwy and north Pembrokeshire too) will be at a severe disadvantage when it comes to both finding employment and being able to play a full part in the life of the local community unless s/he is able to speak both Welsh and English competently. That's not to say that any child who can't speak Welsh elsewhere in Wales won't be at disadvantage too—for being able to speak both languages will always be better than being able to speak just one of them—but that the disadvantage of not being able to speak Welsh will be less in those other areas. Because of this, I don't think it unreasonable to allow parents a choice about the medium of instruction in the more Anglicized parts of Wales, but for that choice to be steadily withdrawn in the more Welsh speaking parts of Wales. South Ceredigion is one of these areas. I think it's fair to assume that any parent in the area who wanted an English-medium education for their children would be sending them to the English stream of Ysgol Gynradd Aberteifi, and therefore that the parents of only two children starting school this year in the whole of south Ceredigion, not just Aberteifi itself, have chosen to not have them educated in Welsh. It is unreasonable and impractical to expect Ceredigion to continue to maintain English-medium education for so small a number, even if it leaves parents with no choice about the medium of their children's education. I thought I'd add a short note to clarify what the different categories of school are, in particular to dispel the idea that Welsh-medium schools teach exclusively in Welsh at the expense of English. Up until a few years ago the definition of a Welsh-speaking school was that more than half of foundation subjects were taught wholly or partly in Welsh. That was a rather loose definition, and could include (at least mathematically) schools which were teaching just over half these subjects only partly in Welsh ... i.e. doing the majority of their teaching in English. Additionally, a Dual Stream school has two of the above categories, usually a WM and an EM stream. I trust this shows that even in the strongest Welsh-speaking areas, English is very far from completely squeezed out in Welsh-medium schools. If anything, it is probably true that Welsh is used more in Welsh-medium schools outside the Fro Gymraeg than inside it. In the more Anglicized parts of Wales the school environment will often be the only place in which a child hears and uses Welsh, and parents and teachers therefore tend to want children to be completely immersed in Welsh while at school, knowing that it will be more than balanced by the predominantly English-speaking environment outside school. But in places where Welsh is more widely spoken there tends to be a more relaxed attitude to how much English is used in school. It's all very well for one of Labour's spokesmen to claim that this "clearly ran contrary to Welsh Labour’s policy position and core beliefs". Half of it might be true, but the other half certainly isn't. Yes, let's be clear that Labour's policy position as a party is not anti-Welsh. In the past supporting the Welsh language was definitely a minority position within the party; but at a national level this has now changed, particularly because Labour decided not to make the language a political football in the National Assembly. That was a very welcome and sensible decision. • who thought it was a good idea to include this quote in an election leaflet? • who gave the go ahead to include it? • who designed the leaflet? • who approved the leaflet for printing and publication? It doesn't really matter who the particular individuals are, but it will surely be obvious to everyone that if just one person in that chain of decision-making actually did think that not being anti-Welsh language was a "core belief" of the Labour party this leaflet could never have been produced. As Oscar Wilde would have said: one mistake may be regarded as a misfortune, two looks like carelessness ... but four in a row? All too often there is a huge discrepancy between what the Labour party is and does at national level and what the Labour party is and does at a local level. In too many parts of Wales, the local Labour party has members, activists and indeed councillors who regard Welsh as something to be opposed. This episode has again shown that Cardiff is one of those places ... but then so is Sir Gâr, Wrecsam, Blaenau Gwent, Caerffili and maybe half a dozen more councils across Wales. 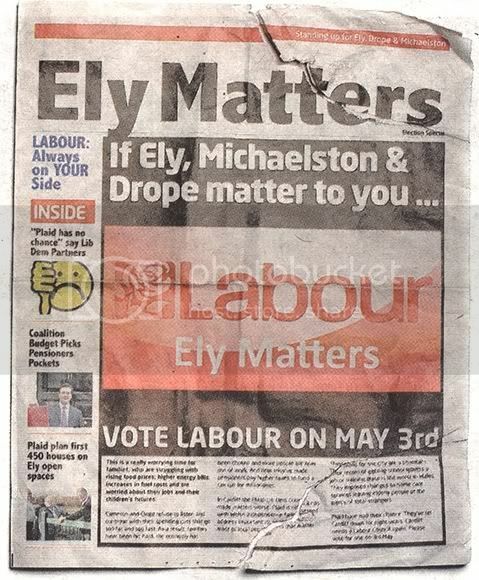 So although Carwyn Jones or someone else at a national level in the Labour party might get round to apologizing for this leaflet and telling us that Labour are not really that sort of party, we need to remember that we are facing local elections in a few weeks' time, not national ones. At local level, Labour is very much uglier. It's that time of year again. Listening out for first cuckoo of spring has been replaced by listening out for the first Tory to complain about free prescriptions in Wales. My reaction to last week's story was fairly similar to that of John Dixon in this post, where he wondered whether repeating the same old thing time and time again was actually more of a campaign than a simple act of reporting news. I was, however, very impressed by some of the comments that followed the Western Mail's story, for they showed that people were no longer being taken in by unbalanced sensationalism being passed off as journalism. I didn't bother writing anything because I'd said almost the same thing in previous posts like this one, but today we have a follow up story in which the Western Mail concentrates on paracetamol. It is so bad that it deserves to be torn to pieces. Paracetamol is in the "Chemicals P-Z" spreadsheet. The figures quoted by the Western Mail are correct, although one figure that they didn't publish would have been helpful. The total number of paracetamol tablets prescribed was 121 million, meaning that each prescription was for an average of 105 tablets. At a cost per prescription of £2.62, this works out at 2.5p per tablet or 40p for a packet of 16. Hardly an inflated price. This is what they cost at Boots. But the idea that this can be inflated to "up to £50m a year" when the cost of consultation and dispensing time is taken into account is bogus maths of the highest order. People go to doctors because they are ill, want to know what's wrong with them, and want treatment for it. What you think might be just a persistent headache could be a brain tumour, and the real cost of a doctor's time will be taken up trying to determine whether it is just something minor or something more serious. Costs cannot be inflated in this way. The cost is what it is: just over £3m a year. "It is scandalous that millionaires and other top earners can get paracetamol at the taxpayer’s expense. "£3m a year would practically fully fund a Cancer Drugs Fund to enable cancer patients to access life-extending treatments currently denied on cost grounds. Labour’s universal free prescriptions policy is simply not sustainable." This of course is the sort of misinformation we've come to expect from Tories (and on the specific subject of drugs for cancer treatment, see this comment). They imply that if it wasn't for free prescriptions, the Welsh NHS would not be spending anything at all on prescriptions for minor items like paracetamol and would therefore have £3m more to spend on other things. The truth is of course very different, as we can see by looking at the figures for a certain neighbouring country that still charges many of its people for their prescriptions. The equivalent (though slightly less detailed) figures for England are that 20,879,114 prescriptions for paracetamol were issued at a cost of £2.93 per prescription. Although we don't know how many tablets were included in each prescription the cost per prescription is roughly the same, which indicates that things are essentially similar in both Wales and England. About 18 times as many prescriptions for paracetamol are issued in England, but England has a population which is 17 times larger than Wales. The conclusion is obvious, the prescribing pattern for paracetamol in Wales is almost exactly the same as the pattern in England. However in cost terms, England spends £61,270,062 compared with Wales' £3,024,300 ... so England spends more than 20 times as much on prescriptions for paracetamol tablets, even though its population is only 17 times as large as ours. The Welsh NHS seems to have got it right. 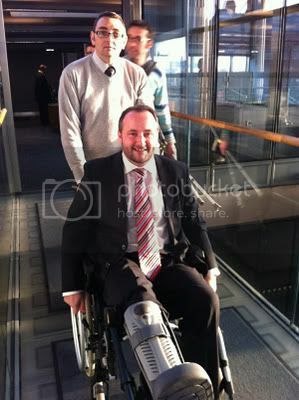 Which is just as well, for it means that there will be enough money available for the Accident and Emergency department at Ysbyty Glan Clwyd to treat an unfortunate Tory who happens to need treatment for a self-inflicted gunshot wound to his foot. I think it will go some way to explain why E.ON and RWE npower decided to pull out of the Horizon Group formed to build Wylfa B, and why it might be hard to find other investors that are prepared to take these financial risks. For those who want a taster before reading the whole thing, there's a basic summary of the report here.